“Hey, guys, Double Mountain Brewery suggests we call our second anniversary brew and new house beer, Cool Camp IPA,” says Ron Swarner, co-owner of Peaks and Pints and the guy writing this story. “Sounds pretty cool,” replies Robby Peterson, my business partner and the cool guy whom overseas our kitchen, among other things. 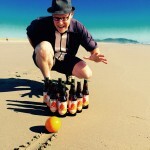 “Should make plenty of happy campers,” adds Justin Peterson, our third business partner, twin to Robby and the cool guy who overseas the business side to our bottle shop, taproom and restaurant in Tacoma’s Proctor District. Peaks and Pints will celebrate its two-year anniversary with a series of prefunk celebrations kicking of Saturday, Oct. 27 and running through Thursday, Nov. 1. In honor of our Cool Camp IPA we brewed at Double Mountain Brewery in Hood River, Oregon, we’ve dubbed our string of anniversary parties, “Cool Camp Week,” with Double Mountain in the house for the beer release on our true anniversary date, Nov. 1. Double Mountain brewer Matt Coughlin, a former Tacoman who packed local venues with his voice and guitar, named the beer after he and his friends pitched tents in what he calls the most beautiful spot in the Olympic Mountains, “Cool Camp.” Coughlin led the Peaks and Pints staff through the brewing process Friday, Oct. 5 while Keller Williams’ albums filled the brewhouse with funk, jazz and reggae. It was cool. Peaks and Pints opened two years ago Nov. 1 to a packed house with a staff that arguably went on to be the main reason people return to our Northend Tacoma community hub — with almost all of the staff still serving our delicious sandwiches and more than 650 bottles and cans to the community today. Peaks and Pints will offer five, prefunk anniversary parties before the big celebration Nov. 1. Founded in January 2016, and earning its 501(c)3 nonprofit status last month, Tacoma Girls Rock is dedicated to empowering youth in the South Sound region through music education. The organization supports “campers” with forming bands, writing music, recording and preforming —while encouraging young women to think about representation, defy gender stereotypes, practice collaboration in a creative environment and walk away with a tool for self reflection and expression. Peaks and Pints hosts a Tacoma Girls Rock fundraiser during our anniversary week. Cut out eyeholes in your spooky sheet and head to Peaks and Pints Halloween night for Stone Brewing craft beers paired with Tacoma’s Tease Chocolates. Maybe you would rather wear a gargoyle costume as you enjoy a Stone 2015 Old Guardian barleywine paired with Sunshine Toffee. Or, don a Ross Dress for Less Clearance Rack Shopper costume will sipping Stone ParaXtranormal IPA paired with Vanilla Milkshake Truffle. Slutty Lumberjack tossing back Sanctimonious IPA and Black Dress Dark Chocolate Ganache anyone? Whatever you decide to wear, do it between 6-9 p.m. at Peaks and Pints to enjoy these and many more delicious pairings. 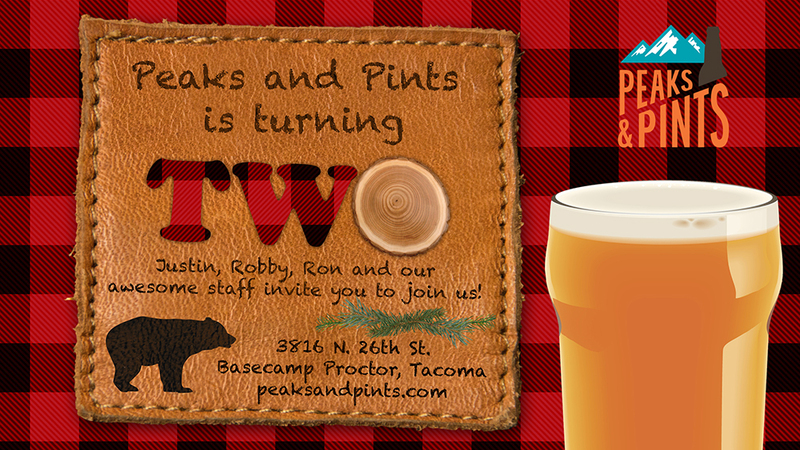 Double Mountain Brewery will oversee the official Peaks and Pints Second Anniversary party with the Hood River, Oregon’s beers on tap, including the new Cool Camp IPA, an easy-drinking, woodsy IPA collaboration with Peaks and Pints. The infamous Peaks and Pints Slideshow will return, as well as all the hugs, beginning at 6 p.m.